This 21 CFR Part 11 compliant standalone data logger measures more than 16,000 readings over a -35 to +80°C (-31 to +176°­­F) range. At the touch of a button, use the on-board display to cycle between the current, minimum and maximum temperature logs seen during the session. 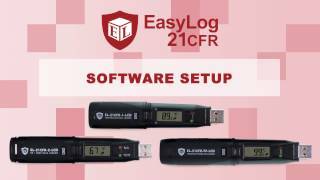 Why Buy a 21CFR Logger? The 21 CFR Part 11 regulations issued by the US Food and Drug Administration (FDA) give the criteria under which electronic records can be considered by the FDA as equivalent to paper records. If you need to meet these regulations or have enhanced data security requirements then you should choose one of our 21CFR loggers, otherwise our standard loggers will suffice. Learn more about 21 CFR Part 11. The EL-21CFR-1-LCD has been specifically developed to meet the data security required by the FDA's 21CFR part 11 regulations. As such it is suitable for use in applications where the integrity of the data is of the highest importance. Click here to view a sample certificate. Secure set up and data download of our 21CFR range of data loggers is enabled by our 21CFR compliant software. Download the latest version from the link below. Could you explain what 21CFR Part 11 is?